What if the relationship doesn’t work? The 2018-19 school term marks the 24th year for the Wisconsin Dental Association – Marquette University School of Dentistry – Pierre Fauchard Academy Mentor Program. A practicing dentist is paired with a first and/or third-year dental student to help form a mentor-protégé relationship with each student. When a dentist-mentor has multiple protégés the older student(s), in turn, mentor their younger classmates. Each program participant is asked to commit for two years. The program year kicks off with an annual dinner in the fall where new mentors and protégés meet for the first time and are welcomed into the program by existing participants. Each mentor-protégé pair defines how they want their relationship to progress, how and when they are in contact, etc. 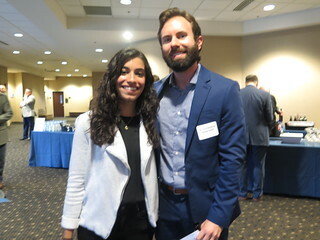 Several organized Mentor Program learning and networking events are offered throughout the school year to give dentists and students the opportunity to reconnect in person and continue building their professional team. Informal and face-to-face communication is encouraged and strongly recommended for a successful experience. Through the Mentor Program, student-protégés obtain counsel and guidance necessary to begin a career in the dental profession and are introduced to important individuals in the industry. Likewise, dentist-mentors are able to benefit from this type of professional relationship as well, staying apprised of practice sale population and the interests of soon-to-be new dentists. The Mentor Program prides itself as being a great avenue for integrating the dentists of tomorrow with the dental community of today. The current program year includes 175 mentor dentists and 330 student protégées. The Sept. 24, 2018 kick-off dinner at Marquette’s Alumni Memorial Union was attended by 505 Mentor Program participants. Not a mentor and would love to get involved with this great program? Contact Betsy Krekling to get involved! Communicate openly and in a timely fashion. Please respect mentor’s time by keeping appointments and commitments. Express your expectations for the relationship. Provide feedback to your mentor. Share your thoughts about school, as questions about entering into practice – learn about their experiences, both positive and negative. Use personal experience and empathy to guide and advise your protégé(s). Help your protégé(s) to explore different career possibilities. Encourage your protégé(s) to develop a plan for the future. Be available to your protégé(s) and invest the time and effort you’ve committed to to display a successful mentor/protégé relationship. Invite your protégé(s) to join you for one or more days of on-site shadowing , giving your protégé(s) the opportunity to experience a typical work day with real patients. Promote professional activities, such as local component meetings, continuing education courses and meetings with dental suppliers and other professionals needed for a practice and a career (e.g., accountants, lawyers, bankers). Share the benefit of being part of organized dentistry (American Dental Association, Wisconsin Dental Association and local dental society) and how professional camaraderie will be impactful throughout the entirety of their dental career. Be a resource for all things regarding the dental profession(e.g., licensure requirements, OSHA requirements, etc). Networking opportunities and planned activities with current and future colleagues. Sharing experience and expertise, while learning about new techniques and trends. Providing guidance and personal experience to contribute to your profession’s future success. Giving back to the dental profession. Staying apprised of changes in dental education. If you feel that your assigned protégé or your assigned mentor has not fulfilled your expectations with the Mentor Program, please do not hesitate to contact Betsy Krekling at the WDA or Linda Gleason at MUSOD. They will offer suggestions to improve communications or, if need be, complete a reassignment. We take great effort in ensuring compatible pairings are made. Dr. Glen Gequillana (Milwaukee) has been mentoring dental students for several years now. “It’s my belief that we all have something to share and to guide these students throughout their journey, whether it be as a sounding board or to take them to task to graduate on time, but mostly for them to realize that the profession they have chosen is fraught with possibilities and success,” he said. Two of his protégés gratefully acknowledge Dr. Gequillana’s service to the Mentor Program, saying their mentor relationship exceeds their expectations.